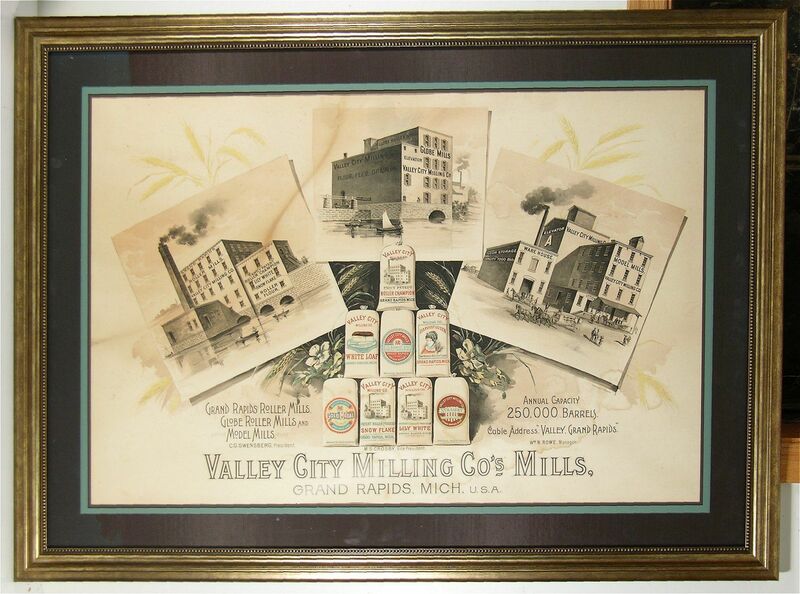 I have always enjoyed this brilliant lithograph from the Valley City Milling Company which was in Grand Rapids, Michigan. This particular early 1900’s lithograph proudly displays their factories with images of their Globe Mills and Valley City Flour Mill plants. In the center the company brilliantly displays their flour bags, in many colors. This contrast is a great look compared to the two tone cream and black coloring of the mills. The bags show many brands including Gold Medal, Snowflake, Lily White, Straight, Harvest Queen, and White Loaf styles of flour. The view on this litho shows their main building looking northeast from the west side of the Grand River. The Valley City Milling Company was located at the corner of Scribner and the Grand Rapids & Indiana Railroad just north of Fulton where the railroad bridge crossed the river. Incorporated in 1894, the main plant burned down in 1923. Shortly thereafter the company moved to Portland, Oregon, thus ending a successful run in Grand Rapids. THE RIDENOUR-BAKER GROCER CO. CONVENTION COFFEE IS A HIT!WHY DID SO MANY PRE-PRO ERA BREWERIES USE EAGLE LOGOS?